(b)whether Government is planning to amend the Bonus Act and waive the ceiling in salary and maximum bonus so as to make everybody in a production unit eligible to get the bonus? (a): As per the Payment of Bonus Act, 1965, any employee is entitled to get bonus provided he / she is considered as an eligible employee. As per the Act, an “employee” means any person (other than an apprentice) employed on a salary or wage not exceeding ten thousand rupees per mensem in any industry to do any skilled or unskilled manual, supervisory, managerial, administrative, technical or clerical work for hire or reward, whether the terms of employment be express or implied.” Government has no specific information of skilled workers being denied bonus. (b): The calculation ceiling and eligibility limit has been revised from Rs. 2500/- to Rs. 3500/- per month and Rs. 3500/- to Rs. 10,000/- p.m. respectively vide the Payment of Bonus (Amendment) Act, 2007 notified on 13/12/2007 and made effective from 1st April, 2006. Keeping in view the large financial implications for both for the Public and Private Sectors further amendment to the Payment of Bonus Act for waiving both the ceilings is not considered feasible at this stage. To All CEC Members of AINVSA. Friends, A delegation led by Mr. Yogender Kumar Sharma National Working President CEC. AINVSA Met hon’able commissioner and join t commissioner admin on May 7 2013 at Samiti Headquarter B-15 Sec.-62 , Noida (UP), on behalf of the President Shree T.P Mani and CEC . The Delegation Consisted of Mr. Vijay National President ,Catering Association , Mr.Verma JNV ETAH (UP) and one Member From JNV Simdega, Jharkhand. The Sole objective of meeting was to know about the latest development concerning the issues discussed during the 9th Feb. 2013 meeting with Ms. Vrinda Sarup ,Additional Secretary HRD.Govt. of India. Highlights at a glance. 1. Pension – on asking about pension matter we were told that a cabinet note has been sent to 6 ministries, for their positive recommendation. Only after seeking positive approval from them it will be taken to cabinet for final decision. 2. 10% special allowance to non teaching staff - on this issue, we were told that quite a good number o meetings have taken place and the committee constituted for the purpose has submitted its final report to JC Admin ,chairperson of the committee. on asking about the progress JC Admin Sh. Naresh Kumar told that he has given the report, with the recommendation of giving 10% allowance to all categories of non-teaching staff, without exception. Now the recommendations are yet to be endorsed by the ministry through commissioner. 3. Other than these two issues the remaining demands like MACP, fixing of working hours , warden will be notified in due course. 4. Very Important – The day delegation reached headquarter, there was an ACTION TAKEN REPORT letter concerning 9th Feb. meeting issues on Shri M.S Khanna’s. Ministry has sought action taken report on the part of samiti. 5. RECOGNITION OF AINVSA – A very significant long – standing an long awaited issue having a direct bearing upon staff welfare, in this regard the delegation laid its claim on AINVSA of Sh. T.P Mani by submitting requisite papers to Hon’able Commissioner. The papers consisted of charter of demands, details of JNV Sagar, Khurai CEC Meeting, bye-laws and registration certificate. The delegation requested hon’able commissioner in no uncertain terms that AINVSA of Sh. T.P Mani was genuine and real. He is our father figure and founder father. Some other people with vested interests, whose sole aim is to loot hard earned money of staff, are misguiding, misleading them and above all destabilizing the system due to their political orientations. We further requested him not to entertain those elements who have hijacked AINVSA and working with the same registration number. The commissioner gave us a patient hearing and gave a very positive nod. He marked our representation to JC Admin for necessary action. 6. COUNSELLING – In this regard, a meeting of all deputy Commissioners is going to be convened at head quarter on May 13, 2013. During the course of meeting it will be decided whether transfers will be done through counseling or the basis of counts. The authorities are divided on the matter. 7. PROMOTION - Promotion process will start in the month of June. NVS will consider first fthe Promotion of VP to Principal, after that from PGT to VP, and then TGT and other posts. 8. NOTABLE – On May 9th, some two or three member of other group approached the Commissioner. They were not entertained by him. He told them clearly that give him nothing in the name of AINVSA. He was already in receipt of Mr. T.P Mani’s representation through Y.K Sharma. 9. About an Appointment of CEC – The delegation requested commissioner to give an early appointment to Mr. T.P Mani and his newly formed CEC. The commissioner gave his consent by saying that we could go to him any time in summer vacation. 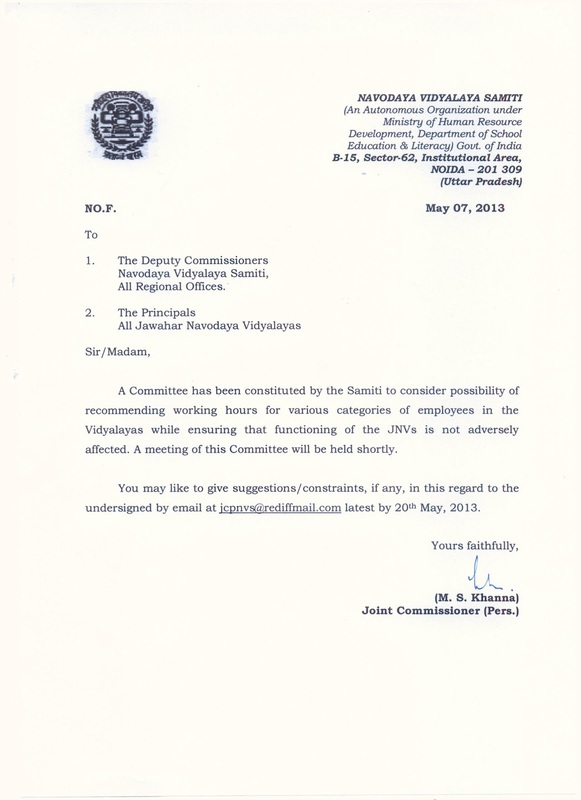 Hon D.Cs n Respected Prinicipals are humbly requested to take Humanity and R.T.E (Right to Education) rules into consideration while sending their suggestions/constraints regarding the working hours of various categories of staff in JNVs in the country... Suggestions of staff , during staff meetings should be reminisced upon by these Principals to make Navodaya Vidyalayas run smoothly in the country ;more productively and efficaciously. The Delhi High Court has held that all government employees who retired even before 2006 will get revised pension according to the Sixth Central Pay Commission. Rejecting the government's plea that the pre-2006 employees would get the increased pension only from 2012, the court directed the authorities to give retired employees the increased pension from 2006 itself. The sixth pay commission, which had raised the salaries of government employees by a significant amount, was implemented in 2006.